Fame, fortune, fear: Why do pop stars struggle with anxiety? A number of superstar singers have revealed their battles with anxiety in recent weeks. Do we need to talk more openly about the condition, and what can be done to overcome it? Few people would disagree that public speaking can be a daunting prospect. Standing up at a social event or special occasion and addressing a large group of people is certain to be a nerve-wracking prospect for many. But when your livelihood and reputation depend so heavily on performing, and thousands of breathless fans are expecting you to blow them away, feeling anxious can be seriously problematic - even if, on the surface, you are one of the most popular people on the planet. 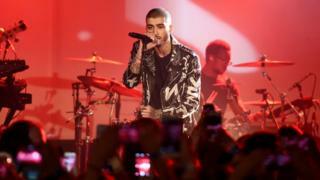 Former One Direction member Zayn Malik cancelled a concert in Dubai at the weekend, citing his "extreme anxiety" about performing on his own. He was far from the first pop star to let nerves get the better of him in recent weeks. Camila Cabello of Fifth Harmony left the stage early during the US pop group's concert in St Louis on Saturday, saying she "was having too much anxiety" to finish the set. Panic attacks caused Selena Gomez to announce she was taking a career break last week because of depression and anxiety connected to her lupus diagnosis, while Bruce Springsteen has written in his autobiography that depression left him "crushed". So have anxiety levels reached new highs, or are celebrities just more willing to be open about it now than they ever have been before? Tom Chaplin, former lead singer of chart-topping band Keane and now a solo artist, told BBC Radio 5 live's Afternoon Edition: "I hope that it's that more people are able to talk about it. "I do also think there's a lot of pressure on people in modern life, and I think that the Facebook generation, [with] this idea that we have to present this perfect picture of ourselves, is taking something away from the authenticity of being a human being. "It's important to make mistakes, it's important to tell people if you feel sad or if you feel low, and I think it can be all too easy to present this image of someone that is super happy and everything is perfect." Nicky Lidbetter, chief executive of the charity Anxiety UK, says high-profile people coming forward to talk about their mental health is "very helpful because it raises the profile of such conditions and gets people talking". "Celebrities talking about it puts a name to a condition that somebody might have been living with for quite some time but didn't know that it was a recognised medical condition," she says. Musicians appear to be particularly at risk of suffering panic attacks, given the pressure they often feel to deliver a perfect performance. Veteran concert promoter Harvey Goldsmith says stage fright is "unbelievably common", even among some of the most accomplished pop stars. He told 5 live: "When artists are performing big shows and the audience get a bit frustrated because they're late - the delay is because they're going through the whole motions of panic before they go on stage. "Often an act will go on 15-20 minutes later, particularly in a big city like London or in their home town, because they've got themselves in a state." In Malik's case, he has performed with his One Direction bandmates since 2010 so is no stranger to performing to large crowds. But this year is the first time he has had to do so solo. His anxiety about performing live prompted him to drop out of Capital FM's Summertime Ball in June - which was due to be his first major solo show. Cancelling one scheduled appearance because of anxiety can cause a string of similar attacks to occur at subsequent events, Lidbetter believes. "For many people that live with anxiety, once they've had a panic attack in a particular situation, they then start to fear having a panic attacks again in other situations," she says. "This process of generalisation occurs where the mind subconsciously looks for similar situations and then actively seeks to avoid those. "In these sorts of scenarios it wouldn't be unlikely for Zayn to be experiencing a 'fear of the fear' - which is literally living in fear of having another attack of fear." Panic attacks can strike at any time and without warning, but Terry Clark, research fellow at the Royal College of Music, says there are "lots of different strategies" to help performers cope with anxiety. "In music we borrow a lot from sports psychology, so we're seeing music students receiving training that is more akin to what athletes might get, so training around mental skills [and] psychological coping strategies," he says. "You do also see the less safe end, the use of different types of drugs and pharmaceuticals for example, so beta blockers are quite prevalent among musicians - those are drugs which inhibit the brain's response to adrenaline, so it essentially calms the body down." Lidbetter says it is possible to overcome anxiety with the right support network and techniques. "We believe strongly, and indeed the evidence shows, that people can and do recover from very complex and severe and entrenched anxiety disorder," she says. "Of course, your recovery is harder if you're in the public eye because there's that pressure to perform and get back to what you were doing, but I think what we would recommend is for people to take things in small steps." "It's about facing up to it but with a strong support network behind you in place, undertaking approaches like cognitive behavioural therapy, displaying self-management techniques like paying attention to your diet, your sleep routine, actively engaging in physical exercise - they're all helpful for keeping anxiety levels at bay."